Amidst the tiring monotonous life of North Kolkata, quietly stands the residence of the great Mullicks. 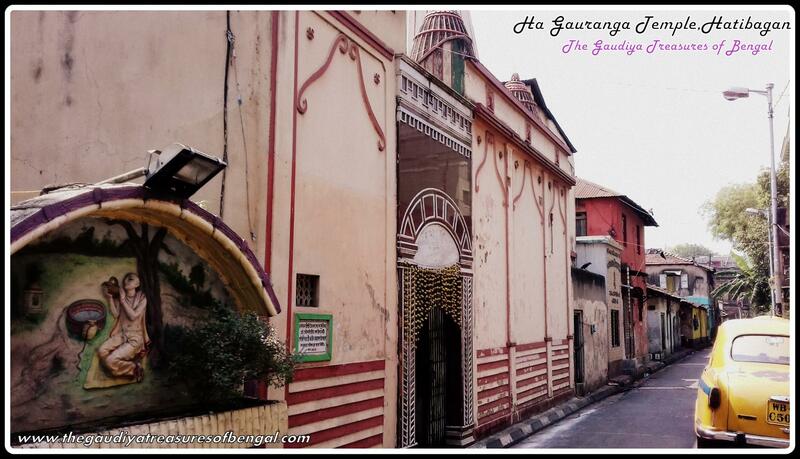 Pathuriaghata street, was once the abode of the bengali rich. 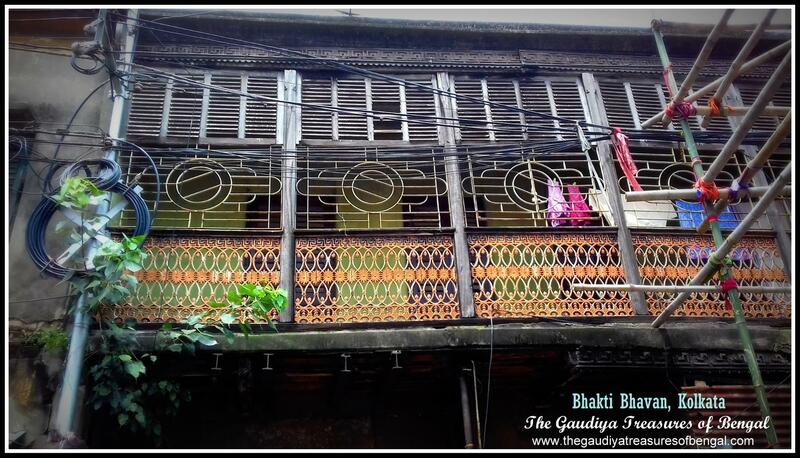 Even in the 21st century the area is replete with colonnaded mansions.The Mullicks have played a very significant role in shaping and preserving the Gaudiya Treasures of Bengal. In course of our pilgrimage across the state, we have come across several significant temples and ancient spiritual sites, which are currently managed or have been renovated by the Mullicks. 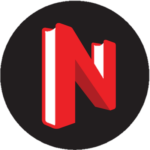 The Mullicks originally belong to the gold mercantile community (suvarna baniks) and have traditionally been rich businessmen. To get a glimpse of their enormous wealth, one might simply look up the example of Jadulal Mullick who has a road named after him. His son Manmatha Nath Mullick, bought a pair of zebras from the zoo to pull his carriage through the streets of Kolkata. 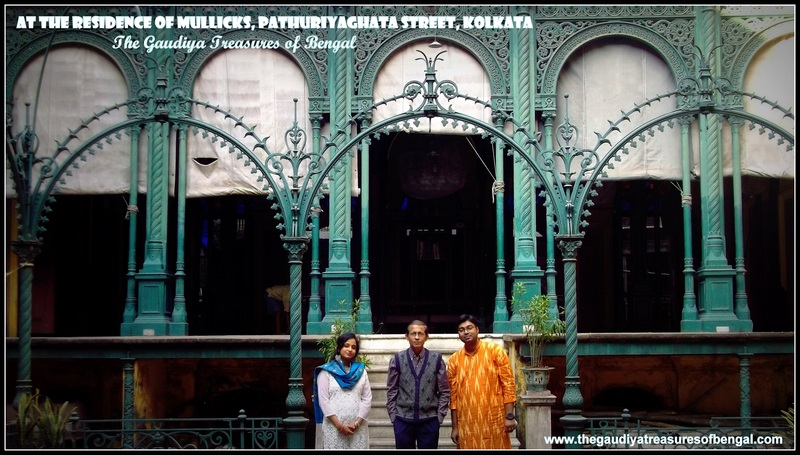 ‘The Gaudiya Treasures of Bengal’ had the good fortune of visiting this ancient residence of the Mullicks here at Pathuriaghata street. We talked to Mr. Rajat Mullick, one of their descendants, and he was more than happy to relate the history of their great lineage to us. 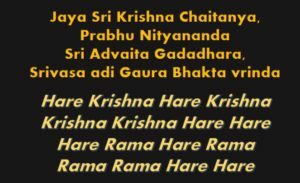 Sri Uddharana Datta Thakura and A.C Bhaktivedanta Swami Prabhupada are the foremost of the great suvarna baniks to have graced our parampara (Brahma-Madhva-Gaudiya sampradaya). 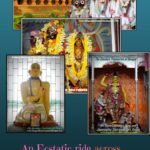 To read and relish more about Sri Uddharana Datta, one might refer to our article entitled – ‘Sri Uddharana Datta Thakura Sripat, Adisaptagram (Near bandel)’. Surrendering his life unto the lotus feet of Lord Nityananda, Sri Uddharana, who had hailed from a very opulent gold mercantile family,subsequently renounced his wealth, fame ,prestige and accepted the robes of a mendicant to further the cause of Krishna consciousness. These heart melting pastimes of Adisaptagram (situated in Hooghly, West Bengal) took place around 500 years back. Srila Prabhupada, the founder acharya of ISKCON, by whose mercy and magnanimity, millions across the world ,can today follow in the footsteps of Caitanya Mahaprabhu and His associates, also traced back his own family lineage to this gold mercantile community in Saptagram.To read more about Srila Prabhupada, please refer to our article entitled – ’The birthplace of A.C Bhaktivedanta Swami Prabhupada, Tollygunge’. Srila Prabhupada once mentioned how the Britishers had established Calcutta, taking the financial help and assistance of these suvarna baniks (Gold merchants).These businessmen had come down from their ancestral homes in Adisaptagram, to set up their businesses here in Calcutta. The Bengalis with the title De ,Sil or Mullick actually belong to this same family lineage and hence share the same gotra (Srila Prabhupada’s earlier name was ‘Abhaya Carana De’). The title ‘Mullick’ was later awarded by the Muslim rulers to those in this community, who intimately associated and conducted business with them.But despite the differences in their surnames, all these family members share a common ancestral root. The Mullicks of pathuriaghata street have also originally hailed from Adisaptagram. Rajaram Mullick, their ancestor, was the first in their family, to shift his residence to Kolkata and set up his business over here.‘The Gaudiya Treasures of Bengal’ would now like to take this opportunity to reminisce about the significant spiritual sites of Bengal, which the Mullicks have been instrumental in preserving and promoting. Sri Gour Mohan De and Srimati Rajani devi became the proud parents of Sri Abhaya Caranaravrinda Bhaktivedanta Swami Prabhupada on the 1st of September, 1896. 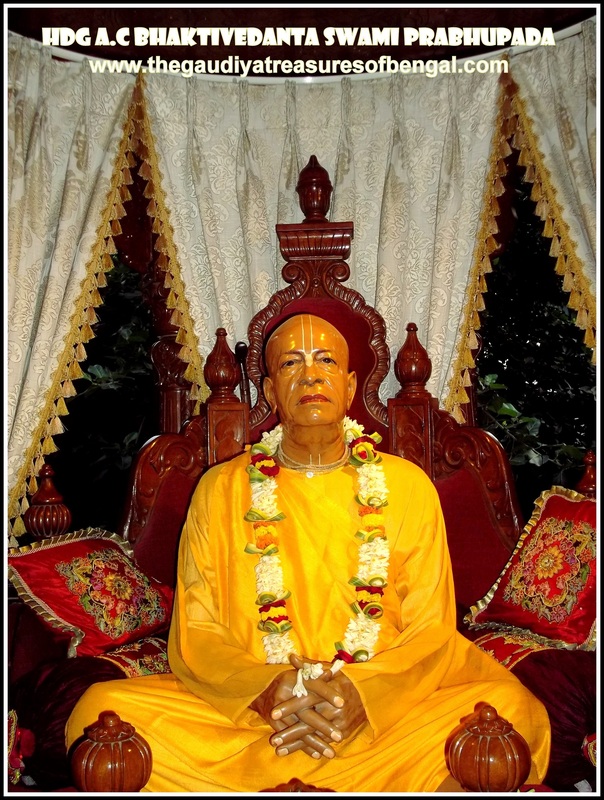 Srila Prabhupada or Abhaya Carana ,as he was previously called, was born on the occasion of Nandotsava, at the home of his maternal grandparents, in the suburbs of Tollygunge. The fortunate jackfruit tree under which he was born stands tall this day. Calcutta back then was the capital of British India and the ‘second city’ of the British Empire. The British and the Indians lived in separate portions of the city although they intermingled in work and business. The Indians lived more towards the north of the city while the british lived amongst their theatres ,racetracks and cricket fields in central Calcutta. Sri Gour Mohan De used to reside along with his family in his rented house at 151 Harrison Road (refer – ‘Srila Prabhupada’s pastime places in Central Kolkata’). 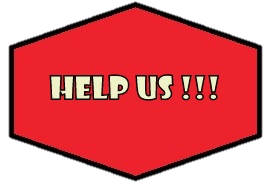 He was a cloth merchant with moderate income and belonged to the aristocratic suvarna banik (gold merchant) community. 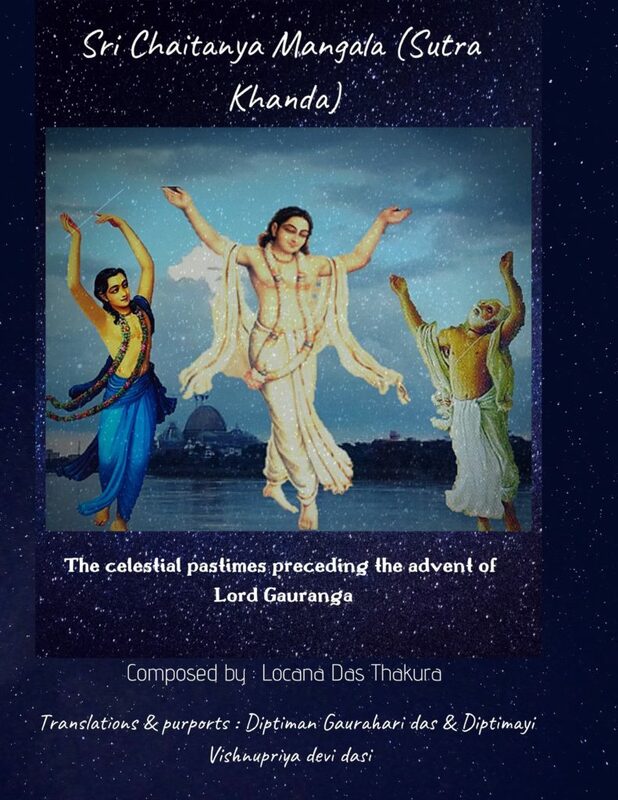 ‘The Gaudiya Treasures of Bengal’ cannot help at this point but contemplate upon the exalted pastimes of another eternal associate of the Lord, Sri Uddharana Datta Thakura, who also belonged to this gold mercantile community (refer – ‘Sri Uddharana Datta Thakura Sripat, Adisaptagram (Near bandel)’). Soon after Srila Prabhupada was born ,an astrologer prepared the horoscope for the child and made an accurate prediction. 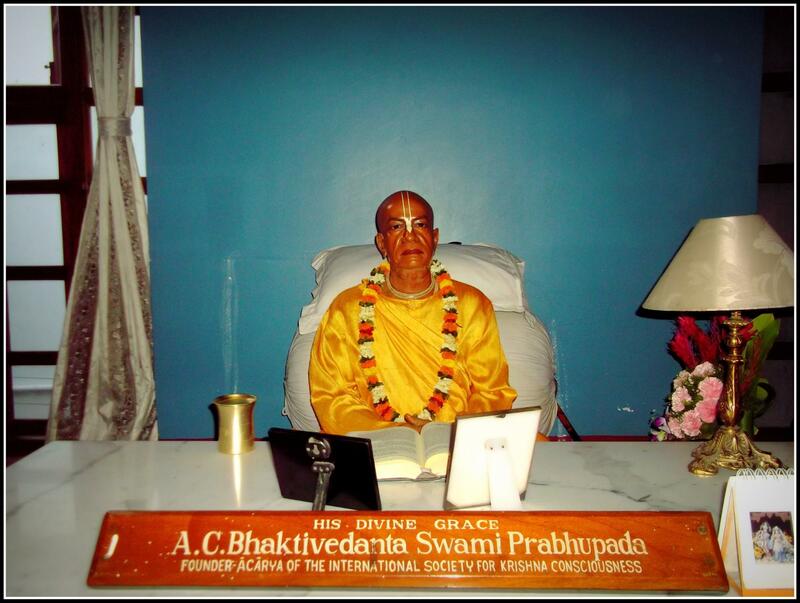 He predicted that when Srila Prabhupada would reach the age of seventy, he would cross over the oceans, become a great preacher of religion and open 108 temples. 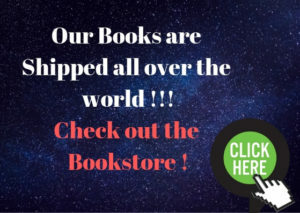 In this article ,however, we shall try to primarily focus on the pastimes that Srila Prabhupada had enacted here in India ,before he travelled abroad and established this worldwide movement. Situated on the bank of the ganges at the heart of North Kolkata, the Baghbazar Gaudiya Math represents the rich cultural and Vaishnava heritage of Bengal. Presently under the authority of the Gaudiya mission, the Baghbazar Gaudiya Math was established by Srila Bhaktisiddhanta Saraswati Thakura (spiritual master of Srila Prabhupada) on the 5th of october,1930. 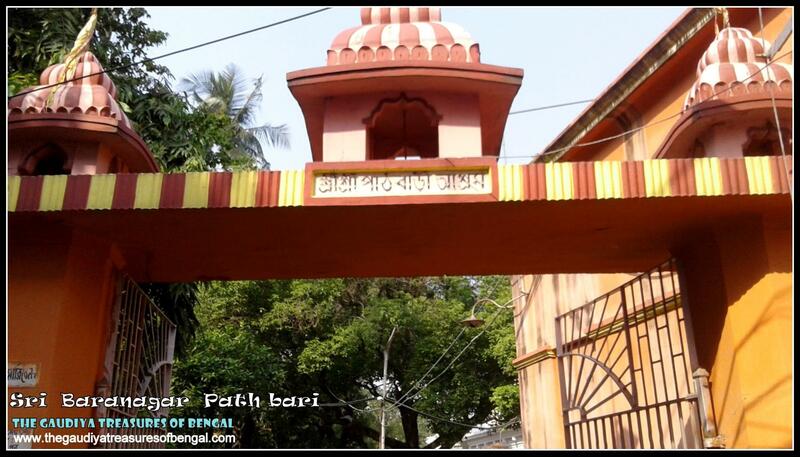 Sri Jagabandhu Dutta belonging to the Banaripara of District of Barisal (Bangladesh) procured a piece of land on the bank of the Ganges at Baghbazar and donated it to Srila Bhaktisiddhanta for the purpose of establishing this temple. Calcutta was then the capital of British India. 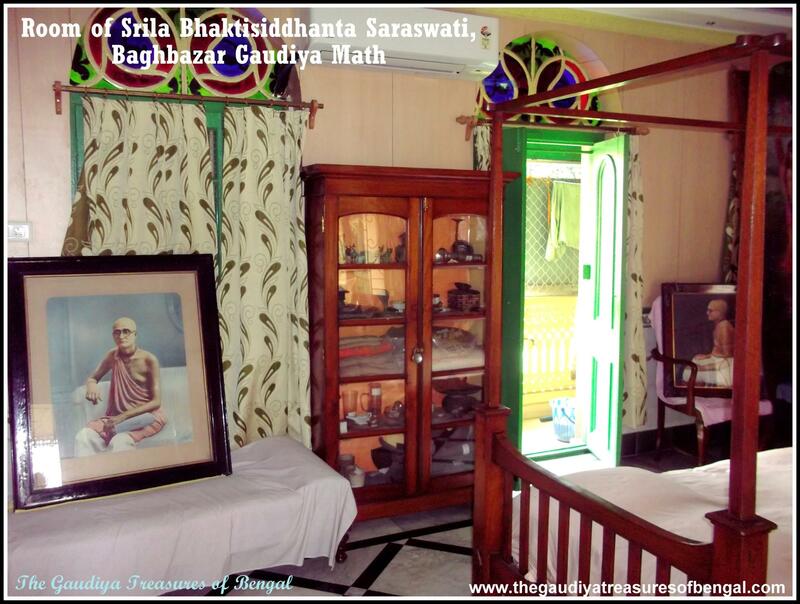 Srila Bhaktisiddhanta Saraswati, after having established the Caitanya Math at Mayapur (refer – ‘Sri Caitanya Math , Sri Chandrasekhar Acharya Bhavan (Masir Bari), Mayapur, Navadvipa’) wanted to open a main center ,his head office, in this capital city. This beautiful temple, ornamented with marble halls, is situated at a place where Mahaprabhu had once rested for sometime while travelling from Jagannath Puri to Baranagar (refer – ‘Sri Bhagavatacharya’s residence,Baranagar Path bari’). Srila Bhaktisiddhanta saraswati Thakura had spent the last six years of his manifested pastimes here at the Baghbazar Gaudiya Math. His Bhajana kutira and the room where he used to live, has been carefully preserved till this day. ‘The Gaudiya Treasures of Bengal’ considers itself exceedingly fortunate to have been able to visit the Baghbazar Gaudiya Math.The grandeur and the imposing presence of this ancient temple has mesmerized us. The enchanting deities of Sri Gaura Radha Binodananda jiu continue to bestow their merciful darsana upon one and all.We seek blessings of Srila Bhaktisiddhanta Saraswati and would like to beg for his permission, in order to pen a few lines in his glorification. Sri Saccidananda Bhaktivinoda Thakura, who is sometimes also referred to as the seventh Goswami, is an eternal associate of the Supreme Lord. His contribution to the Brahma-Madhva Gaudiya Sampradaya is invaluable.At a time when the science of pure devotional service (Bhakti) had almost become lost due to the cultural and religious chauvinism of the ruling British, and the essence of Vaishnavism largely discredited due to the perverted actions and lifestyles of a few non bonafide Vaishnava sects, Srila Bhaktivinoda was largely responsible for rescuing and unearthing the timeless teachings of Sri Caitanya Mahaprabhu. In Fact it was he who ,after conducting a painstaking research, had rediscovered the long lost birthsite of Sri Gaurasundara (refer – ‘YogPeeth, Mayapur, Navadvipa – The birthplace of Sri Caitanya Mahaprabhu’). Srila Bhaktivinoda Thakura, was not only a magistrate, but also a renowned and recognised scholar in his days, with vast knowledge in english,bengali,hindi,oriya and sanskrit.He was also a member of the royal asiatic society of London. Such was the degraded state of affairs during those days, that Srila Bhaktivinoda Thakura could not find a bonafide copy of Sri Caitanya Caritamrta, the most important literature for understanding Lord Caitanya’s life and teachings, anywhere. It was only after several enquiries and a long wait, that he received a copy of this book. He subsequently published it along with his commentaries (Amrta-pravaha-bhasya). Likewise, he was instrumental in unearthing several ancient manuscripts like Caitanyopanishad ( portion of Atharva Veda) ,Sri Krishna Vijaya, etc. ‘The Gaudiya Treasures of Bengal’ considers itself an insignificant servant of Srila Bhaktivinoda Thakura, whose causeless mercy has enabled us fools to get a glimpse of his elevated stature and pen a few lines in his glorification. Sri Kavi Karnapura reveals in Gaura Ganoddesha Dipika that Sri Gadadhara Das was the combined incarnation of Srimati Chandrakanti devi (an expansion of Radharani) and Purnananda Gopi, who was a dear friend of Lord Balarama. Srila Krishnadasa Kaviraja Gosvami identifies Sri Gadadhara das , to be the twenty-third branch of Lord Caitanya’s desire tree of devotional service .He has also referred to him as the ‘topmost’ (sarvopari) branch for he had inspired the Kazi (Muslim Magistrate) to chant the holy names of Lord Hari. (Sri Gadadhara das shakha sarvopari, kazi ganera mukhe yenha bolaila Hari). 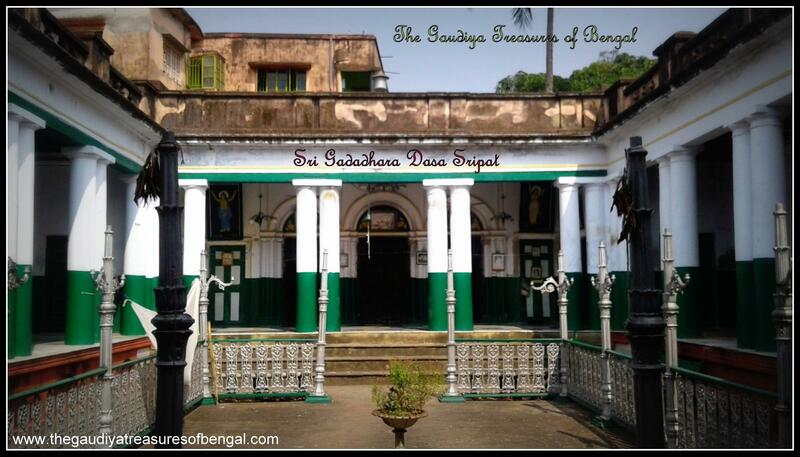 The Sripat of Srila Gadadhara das is situated on the outskirts of North Kolkata, at a place called Ariadaha. Located on the bank of the Ganges, this exalted site, is exceedingly beautiful and spiritually surcharged.The place came across as very quiet,serene and a perfect escape into the realm of transcendence.Sri Gadadhara Das had resided over here at Ariadaha for many years.Finally he shifted to Katwa, where he spent his last days serving the deity of ‘Bara Gauranga’ at Gauranga Bari.’The Gaudiya Treasures of Bengal’ has covered the details of Gauranga Bari in a separate article entitled – ‘Sri Gauranga Bari (katwa) – Where Mahaprabhu accepted Sannyasa’. 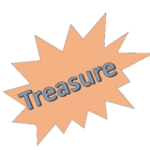 Here at Ariadaha, Sri Gadadhara Das had manifested several of his heart melting pastimes. It was here at Ariadaha that he had established the worship of his beloved Bal-gopal deity. 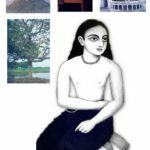 Lord Nityananda had also spent a few days here and had performed His ecstatic sankirtana pastimes (described later in the article).The devotees who presently serve this dham are very simple bengalis who were exceedingly happy to narrate the awe-inspiring history of this place to us. The temple has been managed by different authorities in the course of these last 500 years.Finally the temple was renovated in the year 1849 by Sri Madhusudana Mullick of Kolkata, who had also arranged for the deity worship to be carried out properly (refer – ‘The pious Mullicks of Bengal’).The team from ‘The Gaudiya Treasures of Bengal’ considers itself exceedingly fortunate to have been able to visit and smear our sinful bodies with the all-purifying dust of this holy place. Amidst the hustling busy streets of North kolkata, quietly resides an exalted spiritual destination. Referred today as the ‘Ha Gauranga Matha’, is the sacred place where Sri Caitanya Mahaprabhu halted on His way to Jagannatha Puri, in order to quench His thirst by drinking some water. There is an inscription on the temple walls, which describes that after leaving Baranagar, Lord Caitanya reached here travelling through the bank of mother ganges. Here He stopped for a while to drink some water and thereby sanctified this place with the dust of His lotus feet. After He had finished, He continued on His journey and halted next at the ashrama of Sri Ananta Acharya, who then used to reside at Atisara (present day Baruipura). 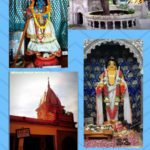 ‘The Gaudiya Treasures of Bengal’ has covered Lord Caitanya’s visit to Baruipura in a separate article entitled – ‘Sri Ananta Acharya’s Sripat, Baruipura’. Sri Bhagavatacharya ,the 76th branch of Sri Caitanya Mahaprabhu’s desire tree of devotional service, met Lord Caitanya on the banks of the river Ganges at a place presently known as Baranagar (which is about 8-10 kms from kolkata). Srila Prabhupada mentions about Sri Bhagavatacharya in his commentary to Caitanya Caritamrta (Adi Lila, 10.113 purport).Sri Raghunatha Upadhyaya , as Bhagavatacharya was then called, used to reside at Baranagar ,on the bank of the Ganges, and daily recite Srimad Bhagavatam (Bhagavata Purana) in his small hut. It so happened that once , while Sri Caitanya Mahaprabhu was en route to Jagannatha Puri, and was passing by Baranagar, a very beautiful recitation and a sublime devotional explanation of Srimad Bhagavatam, entered His ears. Being curious, He immediately entered the cottage, where He found Sri Raghunatha reciting the spotless literature. Seeing Lord Caitanya ,Raghunatha fell at His feet, and hearing his recitations, Sri Caitanya Mahaprabhu fainted in ecstasy. Lord Caitanya later remarked that He had never before heard such a beautiful explanation of Srimad Bhagavatam. He hence conferred the title ‘Bhagavatacharya’ upon Raghunatha and ordered him that his only duty henceforward was to regularly recite Srimad Bhagavatam. Sri Bhagavatacharya had later compiled his commentary on Srimad Bhagavatam in a book called ‘Krishna Prema Tarangini’.